I soon found myself standing in line at the airport with a long hosta leaf sticking out of a jar of water to keep it as fresh as possible. I was very lucky this year with healthy growth (no slugs, no cutworms, and no water mineral stains on the leaves) of a perfect perennial—a hosta! I mean, I have never had an award winner before. Anyone can tell, even if they don't know anything about plants, this hosta has an appearance of being artificial. As the weeks went by, the hosta kept growing lovelier and lovelier until I couldn't stand it anymore! I contacted the Midwest Regional Hosta Convention official in Iowa and asked if it was too late for me to enter the cut leaf competition at the convention in Davenport, Iowa. He told me I still had time. A friend, Roxanne, who lives near Davenport (who entered several leaves in the cut leaf competition and knows more about hostas than many collectors ever will), volunteered to pick me up at the airport. Transporting the leaf two thousand miles was not only a hilarious ordeal, but painful! I soon found myself standing in line at the airport with foliage sticking out of a jar of water to keep it as fresh as possible. With restrictions at the airport, I had to wait in a long line to get through the security system. When I arrived at the X-ray machine, they sternly took me out of line and said "What's that soaking in?" "Water," I nervously answered. They made me get out of line and dump out the "terrorist water" because no liquids are allowed on the plane. I went to the bathroom, dumped out the water, emptied half a roll of paper towels, soaked them in the sink, and wrapped them around the base of the stem. By the time I arrived back in line, it was much longer. While I waited, water dripped like crazy off the paper towels and my fingers. By the time I got to the X-ray machine, the custodian had to mop up the floor behind me. A security person handed me a gray tub to put the hosta leaf in. I carefully ran my precious leaf through the slatted rubber flaps and into the machine for examination. My socks were soaked from the dripping water. Why were they looking at that leaf so carefully? Were there explosives in the veins? What was the hang-up; haven't they seen a leaf before? You can see right through it; there's nothing to hide! Fortunately, there was no damage when it came out on the other side of the machine. Running in slushy shoes, I high-tailed it to the bathroom to re-fill my jar. As I was standing in line to board the plane, people kept eyeing my hosta leaf. Men would say: "What is that, is that thing real?" "Wher-d'ya-find that?" Women would say: "Oh, I made one of those" "Is that real?" "My grandmother used to make those." I have to admit it actually did look artificial. There was one stop to the Dallas-Ft. Worth airport on the way to Iowa. On the plane, I had to sit there for two hours holding that jar of water because the leaf was top-heavy. I was so uncomfortable! The man next to me didn't stay anything, he just looked at me a few times and rolled his eyes. When we arrived at Dallas-Ft. Worth, I desperately needed to use a restroom! I'm not sure if it was from holding a jar for two hours, or from the water in my shoes, but I was in agony. You know how it is. When you're stressed out and in a rush to get somewhere, it is hard to find something like a restroom in a crowded airport. In desperation I ran out of the secured area. When I finished I had to stand in the security line all over again! My poor hosta leaf. After passing through the check point once again, I swear I saw the same custodian mopping up after me again. Finally, with cramped arms and fingers, and another full bladder, I arrived in Davenport. When my friend Roxanne greeted me, she dropped her jaw and stood there in absolute shock! "Oh my god!" she exclaimed. 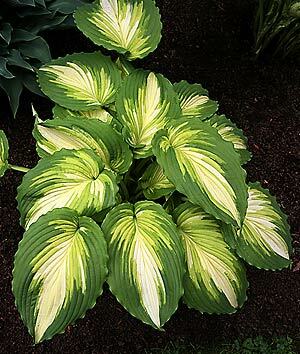 This particular variety of hosta for some reason, does not color well in the Midwest. She had heard about this variety, but hadn't seen one this vibrant in person. When we got to the Radisson Hotel where the Hosta Convention was taking place, she rushed me over to the cleaning room, where entrants prepare their cut leaves. There was cotton, Q-tips, spray bottles and all sorts of delicate cleaning devices to carefully clean a hosta leaf. You have to rub it carefully here, and wipe it carefully there. Where the leaf meets the petiole, you have to use a moist Q-tip and delicately run the swab through, back and forth, to get all the debris out. The judges use magnifying lenses when inspecting each leaf. There has to be absolutely no dirt, stains, cuts, water-marks, bruises, or sunburns on the leaf. Roxanne pointed out something to me that took the wind right out of my sails. Because the leaf had been sitting in a jar of water for so long, the petiole had rubbed against the jar, slightly bruising it. Just slightly, but it was there. But still, the judges are looking for perfection. Something else I did not know, the cut leaf had to be displayed only a certain way. Different size vases, to match the size of the leaf and petiole, are handed out to each entrant. You fill the narrow vases with just the right amount of water. Then stuff cotton around all the sides of the petiole to hold the leaf in the center of the vase without touching the sides. It was easier than I thought it would be. When I was done with the cleaning and display, I handed the leaf over to one of the officials, who carefully took the specimen to a locked room for judging the following day. People in the Midwest were supportive when they heard of my delivery of my precious cargo halfway across the U.S. There were other comments too, but I'd rather not say. When the judging was over, we entered a large banquet room. There were very long tables standing side by side with white table clothes draped over them. Vases were organized holding leaves varying from the size of marbles to large beach balls, with hues of yellow, gold, green, blue and variegation, in many different categories. And they were so clean! 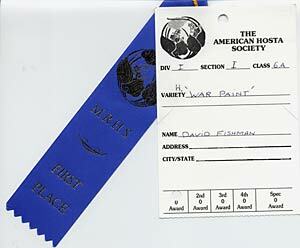 There were several kind of ribbons, some with large rosettes, some small. As I was walking up and down the tables admiring the displays, I noticed Roxanne looking at me from the cross the room with a big grin on her face. Than I saw Dr. Dave, a new acquaintance, showing me a smile with his thumbs up. I ignored all the vases as I walked quickly around the room trying to find my own. At the other end of the room, I spied my baby with a Blue Ribbon attached to its vase. It won first place! The small bruise must have been incidental. I was told the coloring was outstanding, something these people had never seen before. Thank you slugs, snails and cutworms for not touching my hosta. Even though my leaf didn't receive a special rosette, it didn't matter. I won first place for my category!